This is a collection that consciously steps beyond ‘the newsfeed’, the constant information thrown at us both in daily life and in the online sphere. That world occasional encroaches on this mission in certain stray moments, but David resolutely stays the course to give us something beyond mere reportage or internet chatter. The striking imagery of the collection reminds us that this work exists at a boundary, most obviously, that of the physical landscape of the shoreline, the place between land and sea. The shoreline is a very real and concrete location throughout the poems, but subtly reaches the level of metaphor also, representing as it does so the space between life and death, loss and love found, the solid ground of the present and the less certain waters of past and future. the whisper in the hourglass. The autumnal/wintry setting that pervades the collection also seems to suggest that the work exists in the wake of such loss and questioning, where we view the shoreline differently again – not just as haunting but as one now ‘haunted’ by personal grief. There is a sense of rigour in this which offers a controlled, formal elegance to the language, the observational accuracy perhaps reflecting David’s studies in engineering at university. There is an eye to detail, as ‘Correspondence’ shows, that other writers may well miss. drunk on summer’s insistent song. At the same time, the contemporary world of the ‘looping newsfeed’ and internet babble breaks through on occasion (as it must), impinging on the other reflections of natural setting. Yet found amid this ‘tinnitus’ is more important news, news that matters and captured in the vision of “all the suitcases, empty as grief / that bob on the Aegean…” bringing us closer to the scene, however briefly, of distant calamity. 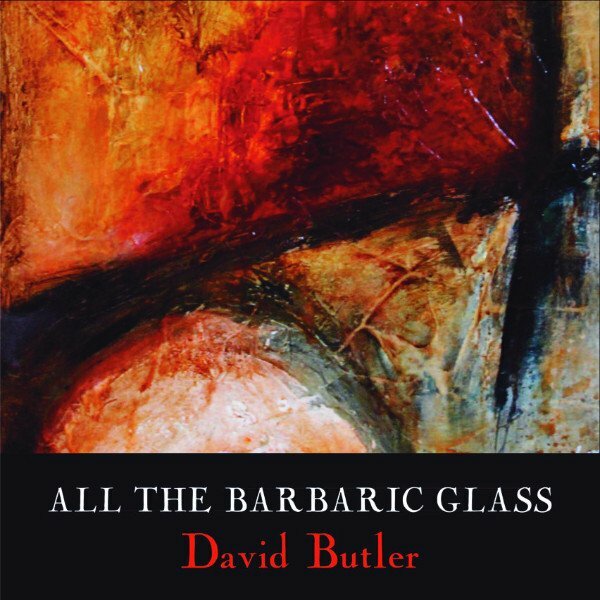 To end, I just wanted to note something I only fully appreciated on a second reading of All the Barbaric Glass and one that strikes me as important and central to this books appeal. That thing is the presence of the question mark throughout these poems. So often when poets ‘question’ (especially these days) they are questioning others in accusatory tones for their social or political ineptitude, their incompetence, faults and lack. The ‘other’, in this sense, is always an easy target for lazy vitriol. Here, though, the questions are those asked of oneself, offering a form of self-reflection and self-questioning that, in the end, is a method of self-interrogation that leaves no place to hide for the poet in these poems. This is not, in the end, a collection that offers easy resolution or explicit consolation, though nor is it one lacking in humanity or tentative hope. It’s not, I say again, less sure. with the sea and wind and world enormous about us.